This is a recipe for Southwestern Instant Pot Scalloped Potatoes. Classic scalloped potatoes get a kick of heat from roasted Hatch Chile peppers and a much quicker cook time thanks to the Instant Pot. This scalloped potato au gratin should be put on your “must make” list, and soon. I love taking a classic recipe and tinkering with it. Sometimes to make it easier, always to make it better, and more than likely to add a little Southwestern flair. And that usually includes adding New Mexico Hatch Chile Peppers or some New Mexico Chile Powder. And in this case, I’ve done both. Hatch Chile Peppers are added to these Instant Pot potatoes for a kick of heat and a beautiful earthy spice. Plus I added some Chimayo Chile Powder to the au gratin topping. The result? Ole’ delicious. I served this at a casual dinner party and everyone was raving about these scalloped potatoes. Do Sliced Potatoes Cook Well in the Instant Pot? Absolutely! And I’ve found that starchy foods and the pressure cooker get along very well. Just like pasta, potatoes cooked in the Instant Pot seem even more delicious than when cooked in the oven or on the stovetop. And who can argue with a four minute cook time instead of an hour in the oven. As always with an Instant Pot recipe, that four minutes does not include the pot coming to pressure and the pressure release time. But what about getting that crunchy scalloped potatoes au gratin topping? Just have a casserole dish standing by and the oven broiler fired up and in just a couple of minutes you have yourself a crispy crunchy topping. After the potatoes are finished cooking in the Instant Pot move them to the casserole dish. Sprinkle on the au gratin topping and slip them under the broiler. Voila. Thanks to the Instant Pot, scalloped potatoes just entered the mid-week dinner arena. Once you’ve peeled and sliced, you’re just minutes away from a delicious creamy potato side dish. And a side dish that feeds a crowd. This recipe fills a 9 x 13 casserole dish, enough for 8 servings. 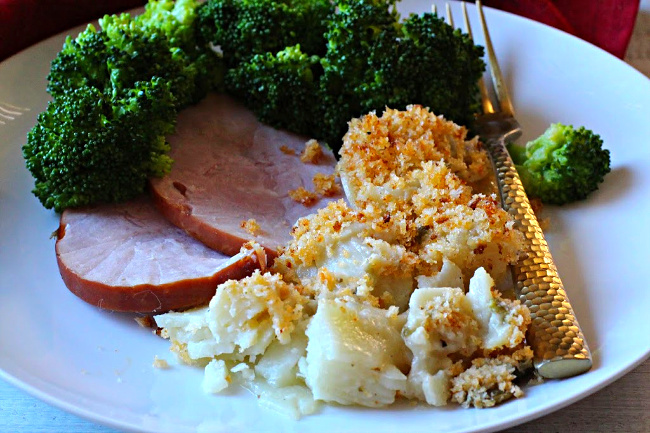 A classic pairing for Scalloped Potatoes is always Ham. Even with this spicy Southwestern take, it goes very well with this Honey and Thyme Glazed Ham. 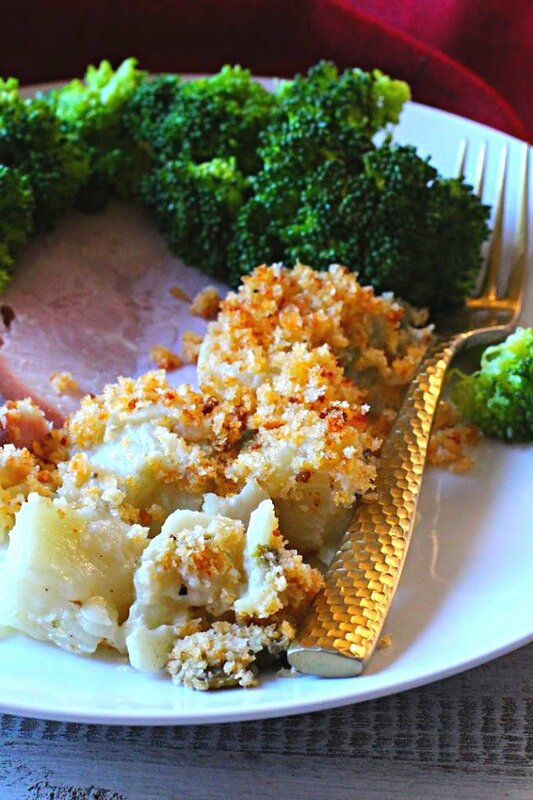 Roast beef is always a winner with scalloped potatoes. You could try this Mexican Pot Roast recipe or go the classic route with Prime Rib. What Kind Of Cheese Should One Use for Instant Pot Scalloped Potatoes? For this Southwestern version, I highly recommend Monterey Jack Cheese or Muenster. I’ve fallen in love with Muenster cheese after I attended a Tamale making demonstration. Teacher and former neighbor, Rosa, encouraged us to use Muenster for tamales, enchiladas and beyond. Muenster cheese is actually an American cow’s milk cheese. Muenster is smooth, pale yellow in color and mild in flavor. Moist and soft in texture it boasts excellent melting properties. It’s great for grilled sandwiches, mac and cheese dishes, pizza and perfect on cheeseburgers. One of the best things I learned at Culinary School was knife skills. Practice, practice, practice. For this recipe to cook evenly and come out perfect, one must slice the potatoes evenly and at 1/8 inch thick. That way the potatoes will cook evenly and the recipe will work with the cook time of four minutes. If the potatoes are cut thicker, the time setting will need to be adjusted. And if you do slice these potatoes with a knife, this will definitely test your knife skills. But the best way to insure that those potatoes are sliced evenly is to use a mandolin. My OXO has settings for 1/8 inch and it works like a charm. This recipe is everyone’s creamy cheesy dream. And who doesn’t like scalloped potatoes with sour cream. Along with the cheese, the recipe calls for 1/2 cup sour cream. Mixed with chicken broth, this provides a beautiful sauce for one killer scalloped potato recipe. 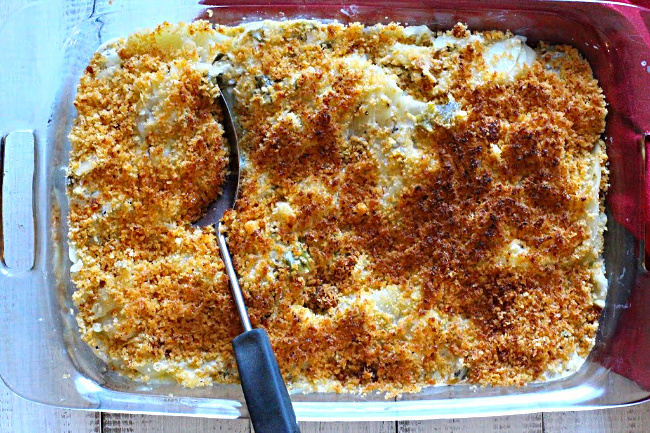 I hope you give this scalloped potatoes au gratin recipe a try, and if you do, please come back and give the recipe a star rating. And if you have a favorite Instant Pot potatoes recipe, let me know, I’d love to give it a try. And if you’re a Hatch Chile Pepper freak-o like us, take a look at my page dedicated to our favorite chile pepper; Hatch Green Chile Recipes. Instant Pot Scalloped Potatoes. Classic scalloped potatoes get a kick of heat from roasted Hatch Chile peppers and a much quicker cook time thanks to the Instant Pot. This scalloped potato au gratin is made even creamier with Sour Cream and cheese. Select Saute and add butter to the pressure cooker pot. When butter is melted, add the onion and cook, stirring occasionally until the onion is tender, about 5 minutes. Add 1 cup chicken broth, salt and pepper to the onions. Put a steamer basket in the pressure cooker pot. Add the sliced potatoes. Lock lid in place, select High Pressure and 4 minutes cook time and start. When timer beeps, turn off pressure cooker and do a quick pressure release. Carefully remove potatoes and steamer basket from the pressure cooking pot. Place potatoes in a greased 9x13 oven safe dish. Stir chile peppers, sour cream and cheese into cooking liquid in pressure cooker. Pour over potatoes. Use a large spoon to gently mix sauce with the potatoes. Top with panko topping and broil for 3-5 minutes or until golden brown. Instant pot scalloped potatoes? Interesting. Didn’t realize you could make such a dish in an instant pot. IP or not, I do love scalloped potatoes with green chile! In fact I love any potato dish with green chile. Yours look quite delicious! Something I haven’t made in a very long time. Thanks for the inspiration! I love the sound of these Southwestern scalloped potatoes. Green chiles make everything better. Scalloped potatoes are wonderful! As are green chilies — such a nice combo. Fun idea to make this dish in the instant pot. Thanks! I do love potatoes! This really suits me just fine! Funny about Muenster cheese. My dad loves it. We never had Cheddar in our house. Just Muenster. But I never thought to use it in Mexican cooking! Pinning! We love Hatch Chile Peppers and I’m always looking for new side dish ideas. I can’t wait to try this one! Let me know what you think Julie. We love it. 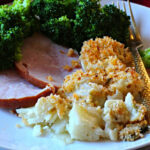 Lea Ann, yes, to me scalloped potatoes must go with ham. And when you brought up the subject of cheese, I was thinking, well, Monterey jack or muenster, of course! (“Great minds” and all that.) This dish sounds soooo good, especially with the addition of the chiles. Adding this one to my IP-must-make list! I’ve pinned and will adapt the recipe as no instant pot in the kitchen but Muenster cheese can always be found in our fridge. What a great idea! I love scalloped potatoes but they take a LONG time in the oven at this altitude. Never thought to try the pressure cooker. Thanks for the inspiration! Me either, but I couldn’t resist. And I was really surprised they turned out so good. Thanks Lucy. Let me know how you like it.